The LVIA was established in 2011 in Gatton, Queensland to serve the needs of the local Muslim Community. 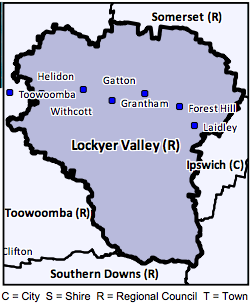 The Lockyer Valley is an hour west of Brisbane and 30 mins from Toowoomba. The region includes Gatton, Laidley, Plainland and the surrounding towns and has a total population of around 38000. Over the years there has been a migrant Muslim population from Turkey, Iraq, Afghanistan and a sprinkling from other countries and more recent migrants include the Sudanese, Burmese and Bangladeshi Muslims as well as a student population from Malaysia, Indonesia and Pakistan who have made the Valley their home. In June 2013 a Community Centre / Musallah was established. The centre is situated centrally Gatton and is open for daily Salah, including Juma'ah Prayers. The activities of the LVIA are open to all communities.